What’s the Benefit of Having Bi-Coastal Production Facilities? Home Blog What’s the Benefit of Having Bi-Coastal Production Facilities? The old adage that “Two are better than one” is one of those phrases that’s worked its way into everything from business dialogue (Two heads are better than one!) to pop music. And while its origin traces all the way back to the Bible, the phrase “Two are better than one” could just as easily be good advice to today’s up and coming businesses looking to expand their production footprints. Spanco’s two facilities in Pennsylvania and Nevada have brought us enormous benefits and are part of how we create the best customer experience for our end users and dealers through convenience, customization, and simple peace of mind. If you’re weighing a one-facility, centralized plan against a more decentralized, multi-facility one, take a look at the following reasons we’ve benefitted from calling more than one location home. Believe it or not, opening a new facility in a completely new area may actually save you some overhead costs that you wouldn’t receive if you built close to home. Consider the costs in your new market. If you’re ramping up production in a big way, you may find that the rate for skilled labor in another part of the country is lower than in your original neighborhood. The same goes for rent or land costs, tax rates, tax incentives, zoning, and utilities. So, while you’ll have some duplication in certain staffing areas, such as reception and plant services, overall savings may be greater the farther you get from home. In the sales world, it goes without saying that the smaller the elapsed time between purchase and delivery, the bigger the smile on the buyer’s face. In 2008, Spanco saw an opportunity to improve its service to its west coast customers by constructing a new facility in Las Vegas. This fully operational factory in the Pacific time zone puts us within one day’s drive of 75 percent of our western clients, and no more than two day’s drive from the rest. Compare that to at least three or four day’s drive to the West Coast from our plant in Pennsylvania. Time is money as well. Manufacturing and shipping items closer to their final destination dramatically reduces the cost you would otherwise incur from longer transits. Reducing costs saves both the company and the end user money, which results in a better overall customer experience. Distributed production facilities, especially those far from corporate headquarters, are necessarily more independent because they often have a smaller executive presence. Employees faced with time-sensitive decisions are forced to make a call. In companies with a more progressive, employee-oriented thinking, this executive presence goes a long way towards fostering independent leadership and will actually speed up the decision-making process after the on-site employees gain sufficient experience. Used in this way, the distributed production model can work as an incubator for high-potential workers, grooming them towards leadership positions. Additionally, having leaders spread throughout the company rather than limited to a single location often improves organizational efficiency by putting routine tasks in local hands, freeing company executives to focus on more strategic decisions. Employing people from around the country creates an employee base that approaches challenges differently. Each facility will develop its own in-house techniques, and each workgroup will come up with its own solutions to problems. These lessons are valuable for a company to learn, and the more people working together to overcome challenges, the more often the company develops truly innovative solutions that improve everything from efficiency metrics to competitive advantages. As a national company, Spanco understands that we are at our best when we’re able to tap into the workforce contributions of more than one metro area. Local employees mean far more knowledge about local environments. This fact has been proven with Spanco reps strategically stationed throughout the country. All Spanco customers get on-demand access to the corporate know-how housed in our bi-coastal factories and reps. What kind of equipment holds up best in the desert heat? What will withstand the salt water and downpours in the rainy northwest? Our local reps have been there and done that. They are able to assess our customers’ application and project needs and use first-hand experience to match them to the best possible Spanco solution. Having employees throughout the country will ensure that your company has experts in every area, not just close to corporate headquarters. One of the facts of business life is the potential for emergencies and inclement weather. All businesses are at risk of natural disasters, such as earthquakes, fires, and floods, as well as man-made issues, such as cyber attacks. Having dual facilities hundreds of miles apart ensures that your company can maintain business continuity even in the face of unpreventable circumstances. For example, if a snow storm in the Northeast disrupts operation in Spanco’s Pennsylvania plant, our Las Vegas facility is able to continue production and make up for lost manufacturing time in Pennsylvania. When we’re still going strong, that means we’ll keep our customers that way too. 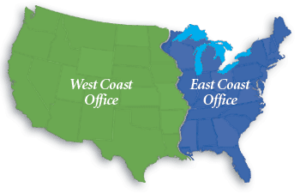 Bi-coastal manufacturing provides companies an insurance policy for manufacturing and distribution while reducing costs.